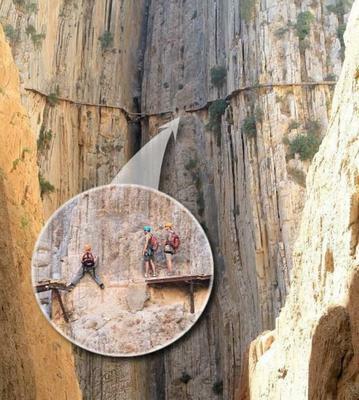 Rey has been wanting to visit the Caminito del Rey since we met, so I surprised him with tickets the weekend just before it closed. It is only closed temporarily whilst transitions are being made by the private company who will now control it, re-opening in approximately one month with entrance fee´s around €10. As we all now the Costa del Sol has it's own micro climate, some days can be super hot and sunny and then all of a sudden the rain with come. Unfortunately today was one of those days, lucky for us we arrived just as the rained stopped and finished the walk 1.30h later just before it started. Although the sky was still full of clouds, the temperature was just perfect. We did complete the walk in good time, though a more leisurely pace and for the less fit, it can take up to 4 hours. We also began at Ardales, which means it is mostly downhill all the way. Head towards El Chorro then Ardales, as soon as you drive through the little tunnel you will find the one and only parking directly on your left, that costs €2, at a white hut. The hut also sells locally produced beer, honey and a few other souvenirs so make sure they will still be open on your return. You must not forget your passport and make sure you are on time for your entry to the walk, they are very strict. 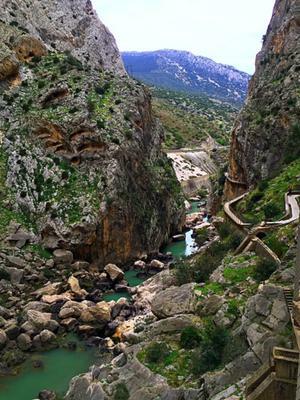 Once parked, walk further along the road until approaching a small entrance to a long dark tunnel on the right hand side, sign posted "El Caminito del Rey”. This is where the walk begins. This wasn’t a guided tour but there was a member of staff every 1km or so to check up on us and answer our questions. 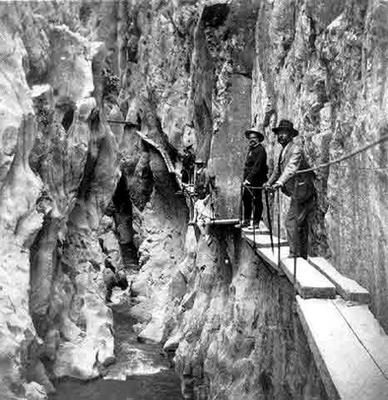 At the beginning a gentleman gave us a brief talk about the Caminito del Rey, why it was originally built, what is was used for and why it was named after the king. They also gave us little white nets and hard hats that you must wear at all times too avoid any potential stones falling on your head, we were lucky and avoided all calamities! I don’t want to give away to much information for this activity as we know things may change and honestly we really recommend you get up to Malaga to experience it for yourself, that way you can tell us about the improvements made by the new management. When the weather is nicer you can also enjoy the beautiful lakes that are very nearby where you can participate in all kind of water sports; canoeing, pedalos, stand up paddle board and more. The last part of the walk is the most spectacular with amazing views when crossing over the 70 meter high bridge. Once ended there is a further kilometre walk until the bus stop where you pay a small fee per person to ride back up to the top where you will find a restaurant called El Mirador the nearest to the parking. Having already lunched their in the past we decided to drive further down the road to the first restaurant on the right, just before a super cute village (Barriada Pantano El Chorro) "El Kiosko". Rey really fancied the leg of lamb which happened to be for 2 people, so I was stuck with no choice (it was his day after all). All I can say is that it was massive and magnificent and our bill came to only €30! Post your own submission to the Marbella Community! It's easy to do. How? Simply click here to return to BLOG Couples.